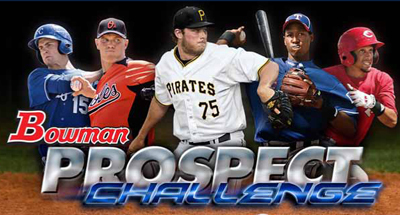 The Bowman Prospect Challenge is an online code contest included in several Bowman baseball products. Randomly inserted code cards can be used to play an online contest where collectors pick players and compete for prizes. The program has both monthly rewards and a grand prize winner. 2012 Bowman Draft Picks & Prospects Baseball - Advertised as 1:6 packs, but they appear to be tougher. When you pull a code card, log in to the game's official site at topps.com/BowmanGame. Enter the unique code found on the card. Your code will unlock four different players. Pick one. A "roster" is full with eight players. You can have more on the bench. Rosters can be changed at the start of each month. Points will be earned based on players' performance and their progression through the minor league ranks. The Bowman Prospect Challenge uses a system called NumberFire to keep track of scoring. Pitchers and hitters are weighed differently in the system. The main criteria for pitchers are strikeouts and walks. For hitters, hits, home runs, slugging percentage and strikeouts are the biggest consideration. As a player progresses through the minors, those playing at higher levels earn more points. Bonus points are also given when someone is promoted. The Bowman Prospect Challenge has both monthly prizes and a grand prize. The grand prize winner gets an exclusive set of 150 Bowman Victory autograph parallels. Nine additional winners will get Bowman Victory autographs. Random codes also unlock 2012 Bowman Draft Picks and Prospects Blue Wave Refractor packs. Each has five cards. Autographs are randomly inserted. Blue Wave packs are given out at random intervals. Winners must pay a $2.92 shipping and handling fee to receive Blue Wave packs. The Bowman Prospect Challenge is not open to collectors outside of the United States or Canada. Those living in Hawaii, Alaska, Puerto Rico and Quebec are not eligible. Codes must be entered before August 1, 2013 at 12PM EST to be eligible for game play. Codes can still be entered through October 1, 2013 at 11:59 PM EST to try for random Blue Wave packs. Canadian winners must answer a skill-testing question. Complete list of rules can be read here.